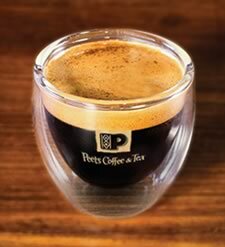 Peet's Espresso is made with dark roasted, fresh ground coffee beans and are hand pulled and is about 86% caffeine-free. Peet's decaf shots are used as the basis of decaf versions of all their espresso based beverages such as Cafe au Lait, Cappuccinos, Caffe Con Panna, Caffe Americano, Caffe Macchiato, Caffe Latte, and Caffe Mocha. How Does Peet's Decaf Espresso Compare? Peet's Decaf Espresso contains 6.67 mgs of caffeine per fluid ounce (22.54mg/100 ml).